Every year, we go to the same pumpkin patch–Bishop’s Pumpkin Farm. We’ve been going there since the kids were about three and it’s become sort of a tradition for us. And even though I’m big on tradition, I thought it might be fun to do something different this year. You know, mix things up and be a little spontaneous. So, on our way home from visiting one of my best friends near San Francisco, we stopped at a pumpkin patch we’d never been to. We never even knew about it until we saw the signs off the freeway. 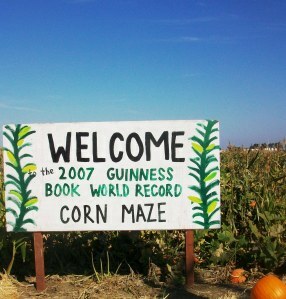 because it’s not every day you get to visit a pumpkin patch that’s been in the Guinness Book of World Records, right? 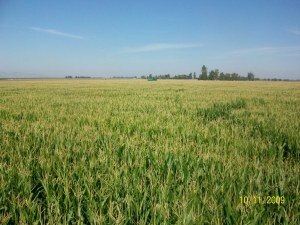 You can’t see it very well in the picture, but at the top of the corn field is a green bridge. Just to give you an idea of how big this maze was, there were four bridges like that, all spaced about the same distance apart. You enter the maze through one bridge, navigate your way (using a map that you get at the beginning) to the next bridge, then the next, and the next, until you find your way out. Well, that’s how it’s supposed to work, anyway. I should’ve known when we going into the maze and saw a boy talking on a cell phone trying to explain to someone on the other line how to get out, that this was going to be a challenge. But about twenty minutes into it, when my daughter the map-keeper, “sort of lost track,” of where we were, I started to realize what we were up against. And I started to think that we might be in that maze for hours. As we wandered around, it felt like we were going in circles. In fact, I’m pretty sure we were. But apparently, I was the only one who was concerned. The kids were having a ball, running back and forth, guessing which way to go. And Mike’s so easygoing that he just took up the rear and went with the flow. I was (beyond) relieved when a family (who looked like they knew where they were going) came up the path. “Follow them,” I said, walking faster. and we finally found the first bridge. and it became very clear that the maze quite possibly was an all-day event. While I was proud of my kids for wanting to go all the way to the end no matter how long it took, the fact was we still had the drive home, and we hadn’t planned for a corn maze of this…ahem... magnitude. Mike and I explained to the kids that if we wanted to be able to explore the rest of the pumpkin patch, we had to turn back. That is one huge corn maze! I would have wanted to 'cheat' too. How fun to have lunch with friends!Thanks for hosting this, Genny! I love that you already have the schedule for Nov. for us. Cute pics!! I'm like you, I would've been getting really worried about being lost. Probably because I get lost so easily. But if I'd planned to spend all day at the maze, then it would've been fun. :-) Sounds like you all have a wonderful time! Huge maze and huge pumpkins! I would love to take the boys to something like that. The salad with the baby spinach and strawberrys and walnuts is so good! I just had it on Monday and ate like three helpings!! Have a wonderful Halloween!! That is quite the maze- maybe a little too intense for me- I don't know if I would have the patience…I just had a get together with my college girlfriends, but alas, no pics! Lots of laughs and deep fried food though! That is an amazingly big pumpkin! How fun to see something like that. That is so funny! My mom-in-law took my kids (all 6 and under – one in a stroller) to a local corn maze – she thought it would be kid friendly, ended up getting lost and stuck (it was very muddy). Thankfully she ran into one group of people who offered to lead them out and another group who offered to carry the stroller. It was quite the fiasco and memory- maker!!! We moved from the Bay Area down to the High Desert in Southern California almost 3 years ago. I visited our pumpkin patch. It was very sad. It probably took up less than 5 acres for the whole thing. We have nothing that grand here. It sounds like a really neat place, I am glad you stopped by to check it out. 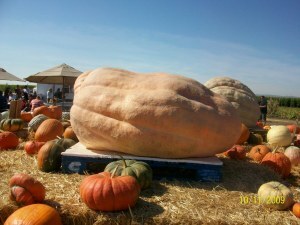 great post -those are some HUGE pumpkins!